Unfortunately, site after site we see has blog categories not optimized for search engine results. You can change your haphazard blog categories easily and get better SEO results! When you or your web designer originally set up your blog, probably little was done regarding deciding on what categories to use. Over time, as you published an article and a new category sounded nice, you probably just added it. If an article fits into two different categories, you happily check off both categories. This is how to make sure your site doesn’t get ranked as well. When Google, Bing, Yahoo and other search engines look at your site, there is no cohesive site skeleton with this approach. The search engines see random categories and the dual categories cause the category silo to bleed into each other, further reducing your rankings. Remember this rule of thumb; categories are like your website’s table of contents and tags are like an index. Use categories sparingly and tags judiciously. Ideally, you create a page, not a post, for each service or product grouping you offer. Each of those pages has at least 1,000 words on it. We decided what to call each page based on the search volume of keywords and the user’s perceived intention. How do we decide this? We load a ton of related keywords into ranktrackr.com and see which words have the highest monthly search volume but lower competitive results. This winning term is the low hanging fruit and can rank well. This term is what we title the page. You also want to get inside the searchers head and think what term would they use if they are seeking your services, products, or content. Armed with these two pieces of information you can now create properly titled and structured main service or product landing pages. Now it’s time to EXACT MATCH your blog categories to your service pages. Continuing with our example, our blog category for web design and development is called web designer, exactly matching the service page title. Even the URL slugs match: moonandowl.com/webdesigner (page) and moonandowl.com/webdesigner (blog category). Why do we do this? This is done so that all the SEO juice from the articles we write passes up to the main service landing page. This page is what we actually want to rank as the head of the silo. With our special SEO plugin (which by the way crushes Yoast and All-in-One-SEO), we can have the category URL be canonically relevant to the main page. That means that the blog category for web designer actually passes all the SEO juice through the URL structure to the main web designer landing page. This is called hard siloing, where the URL link structures on your site carry forward the desired site skeleton. Once you write a blog article, it’s important that you only select one category for it. Even if it can fall into two categories, pick a single one for this particular post. Here is a great video from Semantic Mastery on how that will ultimately help you, not hurt you. 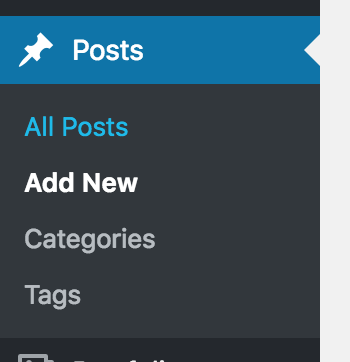 First, click on posts in your dashboard. 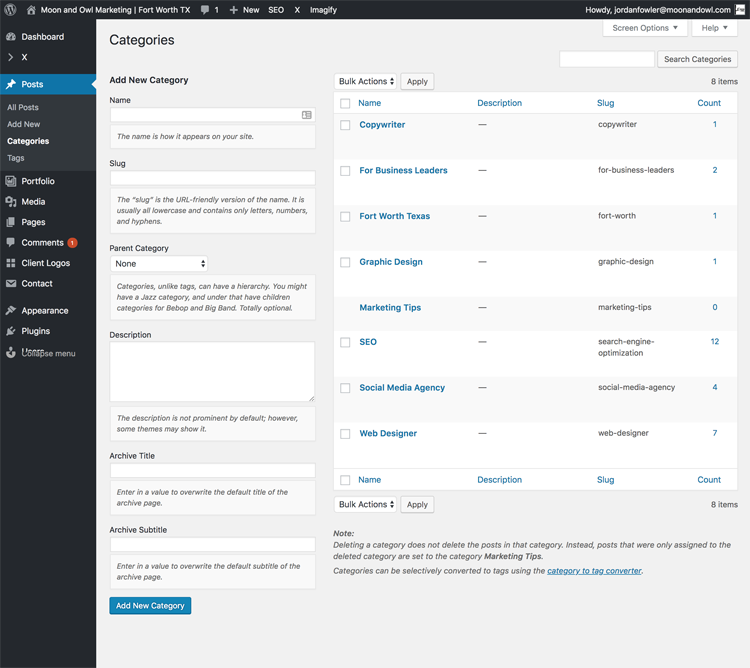 Once you are into the Categories section, you can retitle categories to better match main service pages, eliminate extraneous categories, etc. If you need help with the keyword research to do this, we have the needed tools and are here to help. Next, go through your previous posts and make sure they are only in a single category that best reflects that post’s topic. Finally, for those blogs that had more than one category, you need to 301 redirect the previous duplicate categories to the single one you’ve selected. So get to work on optimizing your site, or call us to do it for you. We’d be glad to help.